Trekking tour is one of the adventurous activity undertaken by travellers. Generally these trails are long and carried out in those places where vehicles are not available. Himalayan terrain is famous for trekking where trekkers risk their life through the snowy slopes. But enjoying trekking holidays in South India is equally in vogue nowadays. South India is not only a display of majestic architecture on monuments and temples. Vast wildlifes, tea and coffee plantations and other hilly terrains in South India invite the adventure seekers to explore the wild side of trekking during holidays. Trekking tour in the grasslands of Munnar, rugged terrain of Coorg or rain forests of Periyar are nerve wrecking as well as thrilling expedition. Here are some of the most popular places to trek in South India. Nilgiri Hills or The Nilgiri is a part of Western Ghats. Situated in Tamil Nadu it shares its border with Karnataka and Kerala. Ooty, Kotagiri and Coonoor of Nilgiri district are the most wanted trekking destinations of Tamil Nadu. Favourable climate, gentle slopes and lesser restrictions make it easy for the trekker. April to June and September to December is the ideal time to trek Nilgiri as it is neither too hot nor too cold. Trekking permissions are given in advance by the Wildlife warden. Coorg in Karnataka is one of the choicest place to trek while in South India tour. Situated by the Western Ghats, Coorg has favourable climatic conditions except June-September which are the monsoon months. January to March is the ideal time. Brahmagiri Ranges and Pushpagiri are famous for trekking holidays in Karnataka. Trekking can also be done near Iruppu Falls, Abbey Falls, Thadiyandamol and Nagarhole National Park. One needs to be aware of the weather conditions and attack of various reptiles and insects. Peermede is visited by tourists not only to explore the beauty of the place but also for trekking. Other adventure activities like paragliding, horse riding and cycling can also be enjoyed here. Kuttikanam, Kalthotti and Vagamon can be ventured as trekking holidays near Peermede. Peeru hills which is about 4kms from Peermede is also a hub for adventure trekking. April-June and September-November is the ideal time for this trekking tour. Ananthagiri Hills in Vizag has favourable weather conditions to enjoy your trekking holidays. Small hillocks and forest surround Ananthagiri Hills which open various avenues for trekkers to explore. Forests here are not dense enough making it easy to trek. It is ideal for those who are trekking for the first time. Other than trekking, the beauty of the forest can also be explored in this trekking tour. Kodachadri in Shimoga district of Karnataka is one of the adventurous trekking trails of South India. Trekking here demands high fitness level. Trekking here can be done during October - February. Karikatte Gate is one of the trek routes to Kodachadri. Total distance of 12-14kms can be trekked within 7-8hrs. Ganesha Guha, Hindlumane Falls and Belakallu Theertha can be viewed while trekking. With due permission of Forest Department, trekkers can make a tented stay here. Munnar is one of the most beautiful hill stations of South India and a significant place to trek in Kerala. Trekking through the hilly terrains of Munnar will reveal the further picturesque side of this place. Trekking holidays amidst winding ways and tea plantations makes the tour a memorable experience. Anamundi is the highest peak of Munnar and is most preferred by trekkers. Trekking holidays amidst tea garden will remain an amazing experience for you. 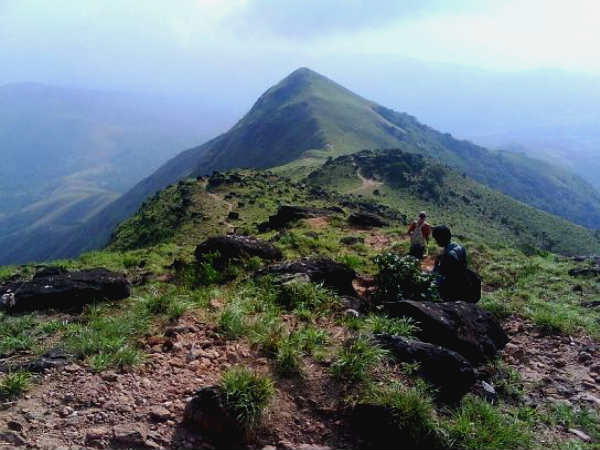 Chembra Peak is the highest peak of Wayanad and as such has become one of the wanted places to trek in South India. Trekking instruments are available from District Tourism Promotion Council. A heart shaped lake which has never dried till date can be seen when one reaches top of the peak. From the top of the peak one can see the entire district of Wayanad. Nature lovers can view mesmerising sceneries around Chembra Peak. Situated in Kannur district of Kerala. Paithalmala shares its border with Karnataka. Being a part of Western Ghats, the hilly terrain attracts photographers, nature lovers as well as trekkers. Paithalmala can be trekked either between June-October or January-March. Leeches and elephants are a common hosts of this place. An observatory tower at the hilltop gives the panoramic view of the valley downhill. Dense forest starts once you reach the tower. Early morning is the ideal time to plan a trekking tour to Paithalmala.